Reading this again for the 3rd time. In those days there were oceans of light and cities in the skies and wild flying beasts of bronze. There were herds of crimson cattle that roared and were taller than castles. There were shrill, viridian things that haunted bleak rivers. It was a time of gods, manifesting themselves upon our world in all her aspects; a time of giants who walked on water; of mindless sprites and misshapen creatures who could be summoned by an ill-considered thought but driven away only on pain of some fearful sacrifice; of magics, phantasms, unstable nature, impossible events, insane paradoxes, dreams come true, dreams gone awry, of nightmares assuming reality. It was a rich time and a dark time. The Time of the Sword Rulers. 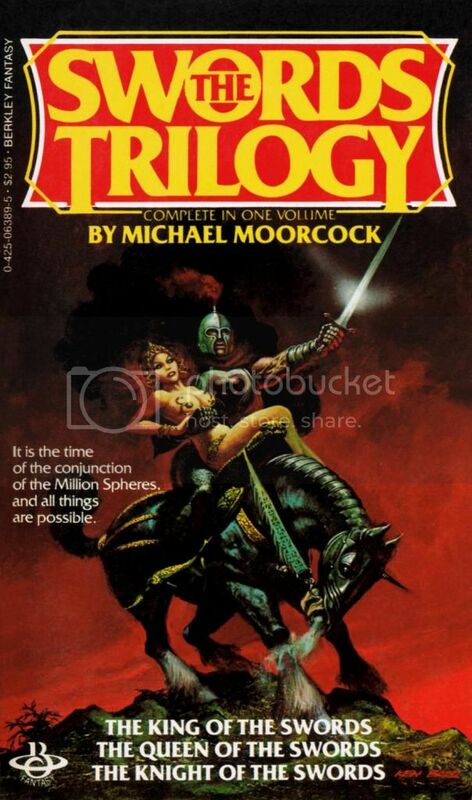 Finished this trilogy early this year if I recall correctly, maybe the end of last year. It's not my favorite from Moorcock's works, but it has the best portrayal of Chaos. Funny enough, I just started re-reading this when I left for work this morning! Wasn't there a second set of books as well that were not as good? I remember being a teen and reading them and being slightly disappointed. That's my experience as well. More from the first three has stuck with me.